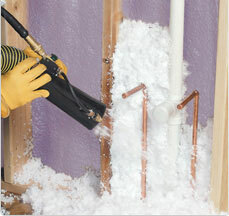 Having effective building insulation is a sure fire way to lower your energy bills. While choosing the right type of insulation is important, making sure it’s correctly installed is essential. Even the most efficient material won’t do much good if it’s applied too thin, has gaps or gets damaged during insulation. At Arango Insulation, our professional technicians have the training and experience necessary to install any type of insulation, from traditional batts to the most advanced foams, with the care and precision needed to ensure optimum energy efficiency. Whether you need spray on insulation for a metal building in Vinings or fiberglass wall cavity insulation in Johns Creek, you can count on Arango to get the job done quickly and professionally. We have been working with many of these products for more than a decade and this experience allows us to finish our work faster than other insulation contractors. You can also count on us for exceptional customer service, with a one-year installation warranty that promises your building insulation will deliver the best possible energy efficiency. For more information on our building insulation services in Atlanta, Kennesaw, Alpharetta, Marietta and beyond, contact Arango Insulation today. Also inquire about our commercial roofing services.